Amazon's new Fire TV Stick comes with Alexa voice commands | What Hi-Fi? You'll now be able to shout at your TV to fast-forward shows or open apps. The new Fire TV Stick is also apparently 30% faster than the 2015 model, and will be coming in early April for £40. Amazon's Fire TV Stick has had an update, predominantly focused on giving media streaming support for the company's new AI assistant Alexa. The new Fire TV Stick with Alexa Voice Remote now lets you control your TV experience with voice commands. It's functionally similar to the Amazon Echo and Echo Dot speakers, meaning users can tell their Fire TV Stick to "find suspense thrillers" or "open Netflix" and expect a response. If you're watching Amazon Video content specifically, you can control playback with more precise commands such as "go back 30 seconds" or "jump ahead two minutes." However, rather than saying "Alexa" as the wake-word for the device, it seems you'll need to push the microphone button at the top of the remote. Amazon has also reworked its UI to provide a "new cinematic experience" by delivering video trailers and content screenshots - apparently it's easier to choose content "without the need to open and close multiple apps." Right now, Amazon says there are collectively 7000 apps, channels, and Alexa skills on the device, including Netflix, BBC iPlayer, ITV Hub, All 4 and My5 as well as Amazon Video. 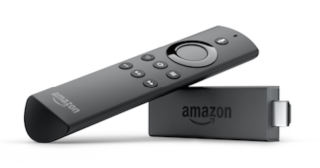 The device is also 30% faster than the previous Fire TV Stick, according to Amazon. The new Stick has a quad-core processor, 802.11ac MIMO Wi-Fi and Advanced Streaming and Prediction (ASAP) for Amazon Video - which means it will be able to suggest content based on the shows you've already watched. It also supports HEVC for 1080p streams. If you want to get your hands on one it's available to preorder now for £40. Amazon will be shipping it to customers from 6th April.